June 15, 2018 – In the week since a post-G7 escalation in rhetoric and diplomatic tension between the U.S. and Canada, a majority of Canadians appear to have warmed to their government’s handling of trade negotiations with the Trump administration. A pair of new studies from the Angus Reid Institute – conducted before, during, and after the fractious G7 meeting – find strong support for Prime Minister Justin Trudeau (62% say he has handled his spat with Trump well) and for his government’s countervailing tariffs in retaliation to Trump’s on steel and aluminum (59% say this is the right approach to take). Indeed, Canadians overwhelmingly favour taking a “hard” approach toward trade negotiations with the Trump administration going forward, with seven-in-ten (70%) preferring to risk further angering the President rather than taking a “soft” approach to try to win back and maintain his goodwill (30%). The tougher tone on trade from south of the border is also proving to be a political boon for the Prime Minister. 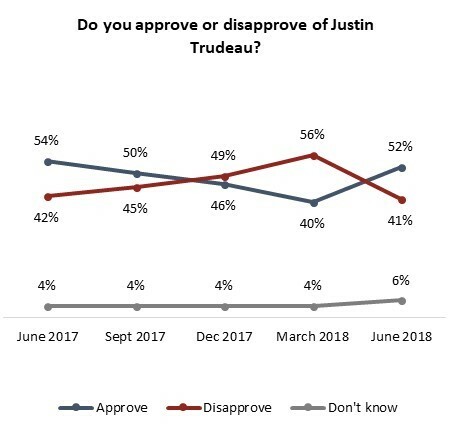 After a year of continually diminishing approval, Trudeau sees a 12-point jump since the last time ARI asked Canadians to assess his performance and has regained the endorsement of a majority of Canadians (52%) for the first time since last fall.